A Neolithic structure in Goseck in the Burgenlandkrejs district in Saxony Anhalt, Germany named Goseck Circle is one of the oldest, best known Circular enclosures connected with the Central European Neolithic. It is an early Neolithic circular structure with entrances adapted to the rising and setting winter solstice sun. It comprises of a set of concentric ditches of 75 meters (around 246 ft approx.) 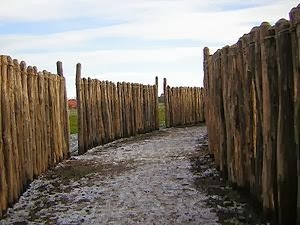 across and two palisade rings with gates in places aligned with sunrise and sunset on solstice days. It lies on the same latitude as Stonehenge at 51° 10’ 42” N 1° 49.4’W) just over 1’ minute of longitude further north. It is known as the earliest solar observatory presently known. When archaeologist decided to excavate this 7000 year old circular enclosure, they did not expect to find any major discoveries which would be worth mentioning the history of Neolithic Europe. 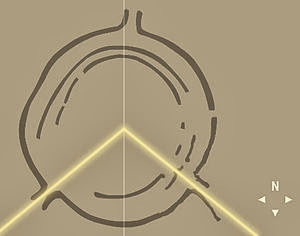 As they proceeded with the excavation, they soon discovered that the two southern gates of the henge marked the beginning of the summer and winter solstice which made the enclosure one of the world’s oldest solar observatories. It was one of the oldest known constructions with this type of astronomical alignment dating back to the 49th century BC which seemed to be in use till the 47th century and relates to the transitional phase of the Neolithic Linear Pottery and the Stroke ornamented ware cultures. This so called Circular Enclosures is one of the larger groups in the Elbe and Danube region, most of them having similar alignments. 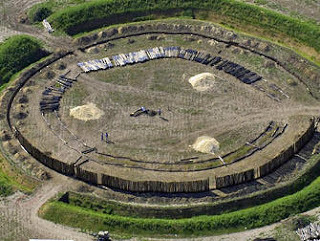 Hundred of similar wooden circular henges together with the Goseck enclosure were built throughout Austria, Germany and the Czech Republic around 4600 BC and while these sites vary in size, Goseck is around 220 feet in diameter and they all have the same features. They have a narrow ditch surrounding the circular wooden wall and a few larger gates which are equally placed around the outer edge. While scholars had known about the structure for centuries, they were debating as to their exact function within the Stroke Ornamented Pottery culture which dominated Central Europe during that time. The Goseck circle helped to provide an answer and as one of the researched enclosure which was well preserved, showed that the sites were used at least in parts to worship celestial objects and constellation. According to Biehl, the archaeologist, this was perhaps the first monumental architecture in the world from his observance that the sites served as ritual observatories 2000 years ago before the ancient Egyptian pyramid were erected along the Nile. After its initial research release on the Goseck structure in 2003, by the Halle team, interest mounted in the enclosure with thousand of tourist visiting that area which is located around 40 miles southwest of Leipzig and although the site predates monuments in southern England of more than two millennia, there is no evidence of any standing stones there. To satisfy the growing interest in this site, the German state of Saxon, Anhalt built a structure of the enclosure on the original site and to ensure authenticity, 2000 oak post were stripped by hand by workmen to give it the same appearance during the Neolithic times. This site was made public in August 2003 and opened for visitors in December 2005.